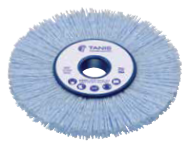 Tanis Long Trim Wheel Brushes are ideal for irregular parts- the flexible filament achieves greater surface contact on curves and edges. Use on a range of industrial applications including deburring, part finishing, edge radiusing, surface finishing and light cleaning for ferrous and non-ferrous parts. For filament length outside our standard offering, contact our engineering team for information on custom brushes. The CeramiX® Long Trim Wheel Brushes feature an innovative 3M grain providing enhanced cutting action up to 3 to 5 times faster than traditional abrasive filaments. The Long Trim Wheel Brush is also available in silicon carbide, a durable grain that is widely used in industrial applications and preferred for finishing ferrous metals. Our wheel brushes are made by molding filament into a urethane based composite hub construction that provides controlled filament density and enhanced brush life. Wheel brushes consistently have a longer brush life and less filament breakage compared to wire brushes.